Our laundry room is located down the outside stairs. Just one level below the main floor. It has a washer and dryer and a table for sorting. Our cottage has a nice sized kitchen. It is an open design and is part of the great room. 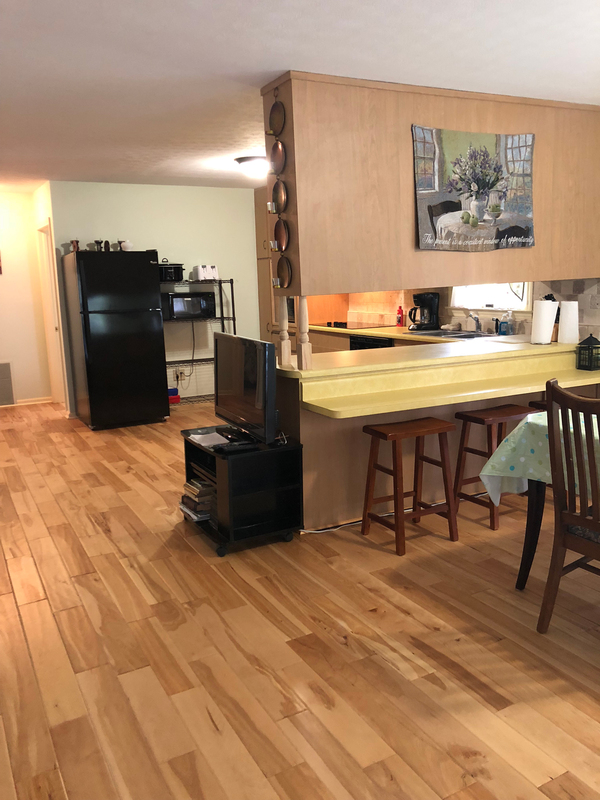 There is plenty of counter space and cabinets. 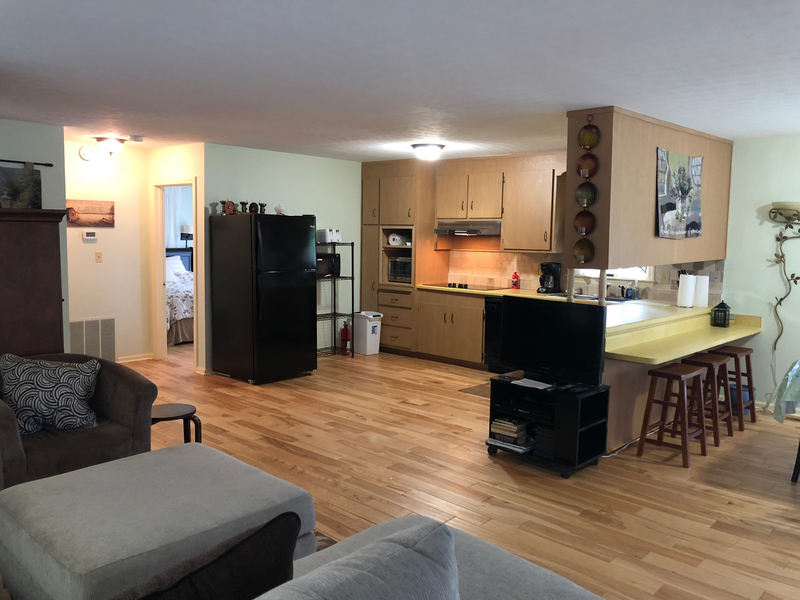 The kitchen has a stove, oven, microwave, dishwasher, coffee maker as well as a refrigerator. Pots, Pans, Utensils, Plates and other basic kitchen necessities are also included. 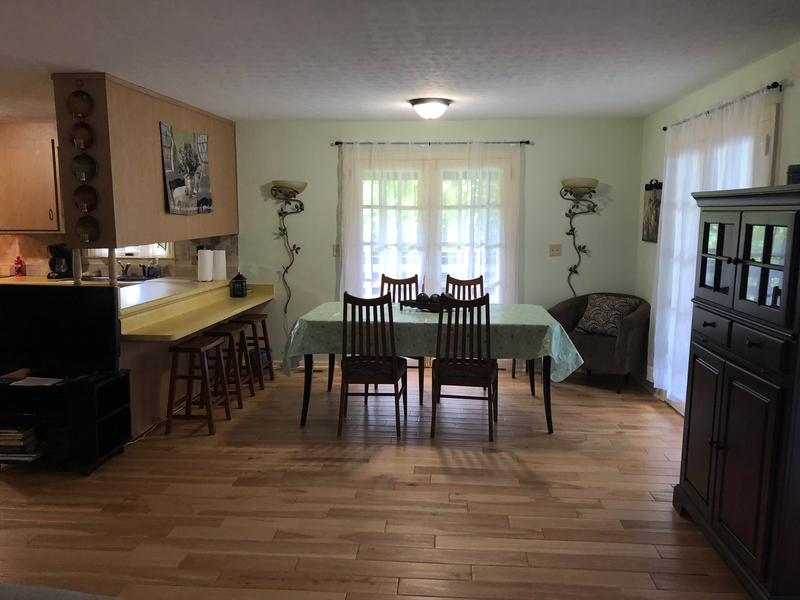 There is a pass through type bar that separates the kitchen from the dining area. The bar has barstools on the other side. The home has two cozy bedrooms each with a queen size bed and a closet. There is a bedside table and a dresser in each room as well. Each bedroom has double french doors that open out onto the wrap around porch. 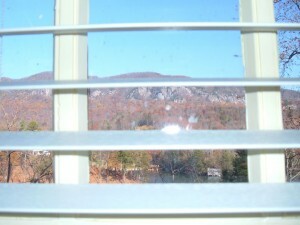 The front bedroom has a view up the mountain and the back bedroom has a spectacular view of the lake and bald mountain. The first three pictures below are of the back bedroom and the pictures below that are of the back bedroom. They are almost exactly the same except for the view. 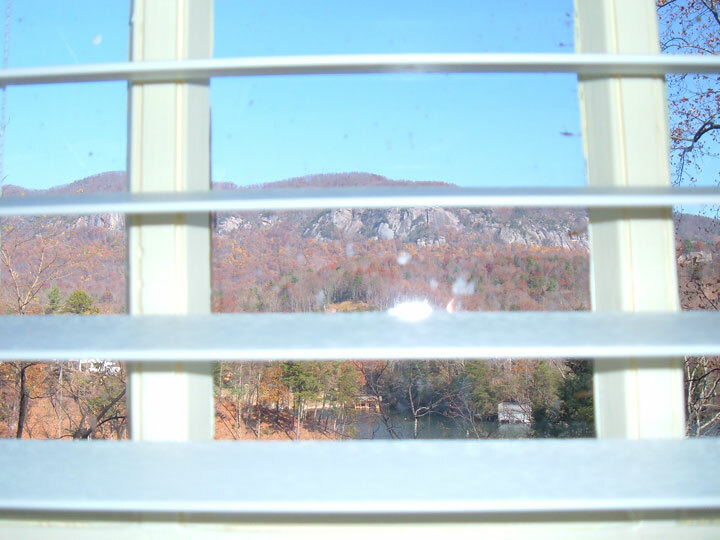 Pictures above are of the back bedroom facing the Lake with views of Bald Mountain and Lake Lure, NC. Pictures below are of the front bedroom. The dining area features a nice table that seats 6 people comfortably with room for two more at the bar. The bar area area is adjacent to the kitchen and items can be passed through. The room has two sets of french doors that open out onto the screened in porch. The living room is a part of the great room. 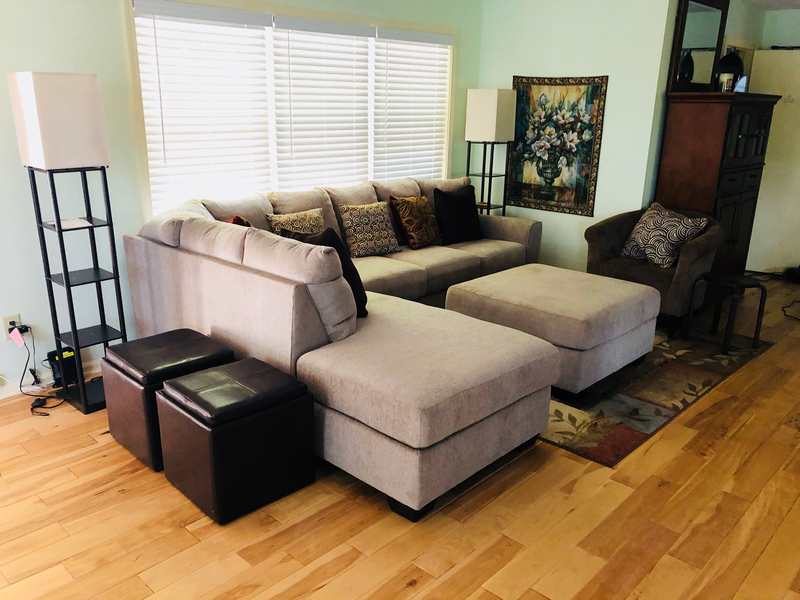 There is a large sectional couch that doubles as a place for two people to sleep. For sleeping just put the ottoman at the end of the chaise. Two adults or two kids can comfortably sleep on the sofa. The living room also has two comfortable chairs. and two smaller ottomans that double as tv trays. There is a television set for Netflix and DVDs opposite the sofa. (no cable tv) Two torch lights provide plenty of light for reading. 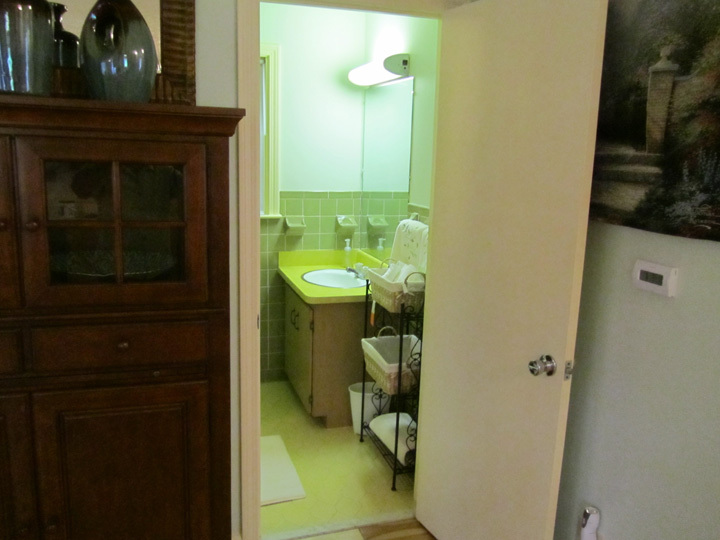 The home has one bathroom which is small but cozy. There is a stand up shower, a sink, and a toilet. It is about the size of a bathroom on a cruise ship. 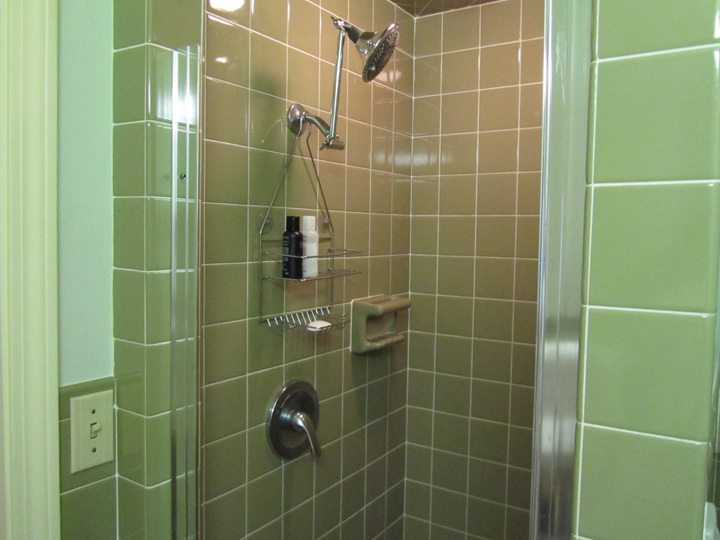 The floors and lower walls are tile as is the shower. Our vacation home has a beautiful and functional wrap around porch. You enter the house via the screened in section of this porch and can exit out on the the open area via two screened doors. There are also benches going all the way around the porch. The views from the sides and back of the porch are beautiful. 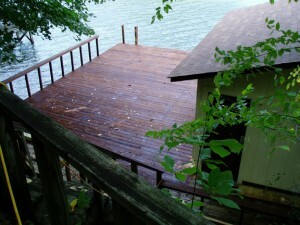 Pictured above is a view from the open wrap around portion of the porch. Pictured above is a view from the screened in portion of the wrap around porch. One of the nicest amenities of the home are the views. Rumbling bald mountain is clearly visible across the lake and there are great views up and down the lake as well. I like to sit on the porch, read a book, and watch the boats go by. 302 Mark Twain Drive is very easy to find. The best way to find it is to google “302 Mark Twain Drive Lake Lure NC 28746”. Click on the little map and then click “get directions”. 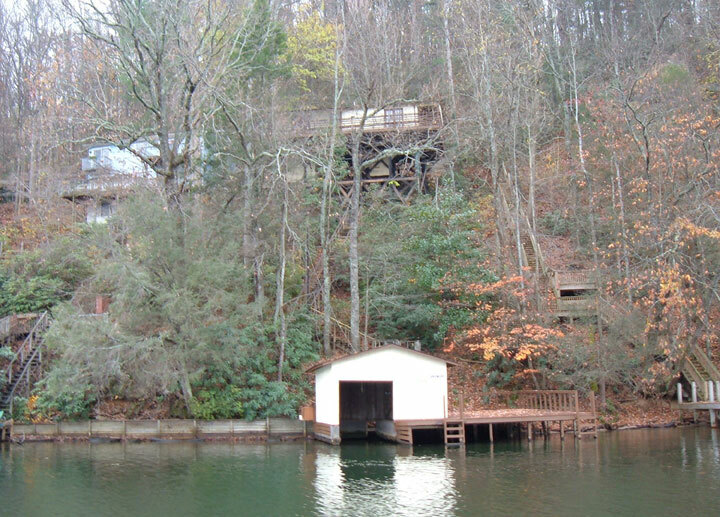 We have provided directions below that cover the two different directions that you can approach Lake Lure. If you are approaching Lake Lure from the east you will be traveling west on Memorial Highway also known as Highway 64/9/74. As you travel west you will begin to see the Lake on your right. As you near the town you will turn right onto Seton Road. Seton Road will curve around to the left and you will begin looking to your right for Mark Twain Drive. Our house is the last house on Mark Twain Drive. You can park in front of the front door or at the end of the street on the gravel rocks. Note-if you see the boat ramp and beach on your right you have gone just a little bit too far. If you are approaching Lake Lure from the west you will be traveling east on Memorial Highway also known as Highway 64/9/74. From this direction you are going to see Broad River on your right. You will come to a nice little town called Chimney Rock. Continue through Chimney Rock and cross the bridge into Lake Lure. 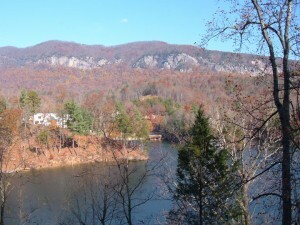 You will see the Lake Lure City Hall, the Beach,the Boat Ramp and the post office on your left. Continue past the post office and turn onto Seton Road on your left. Seton Road will curve around to the left and you will begin looking to your right for Mark Twain Drive. Our house is the last house on Mark Twain Drive. You can park in front of the front door or at the end of the street on the gravel rocks. Note-Seton Road is just a few hundred yards past the post office on the left. Here is a video of the inside of our house. We will be adding more videos soon of the outside and the waterfront. 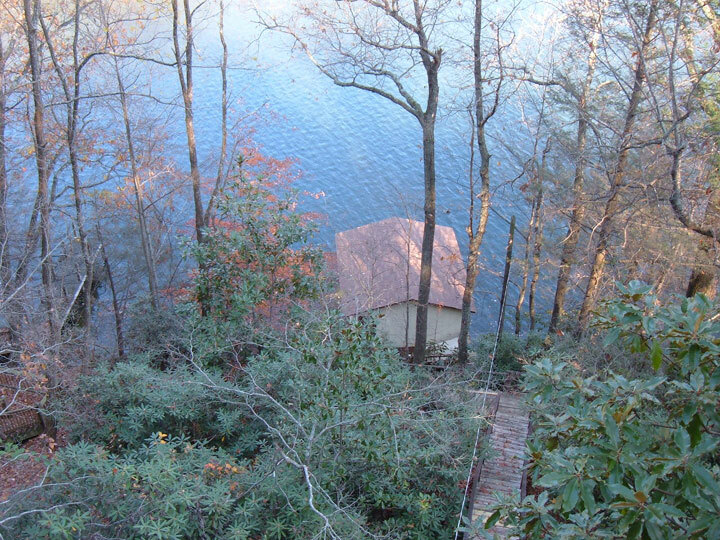 Here is an aerial map showing the location of 302 Mark Twain Drive in Lake Lure, NC. Downtown and the beach is to the left of the house up the lake just a little. -Click anywhere on the map to get rid of the caption. -Click the + or – button to zoom. -Click “View Larger Map” to go to a full screen version of the map. -If you go to a full screen version you can zoom in and then drag the little man onto a road in the city and you can see street views of the town. A very neat feature. 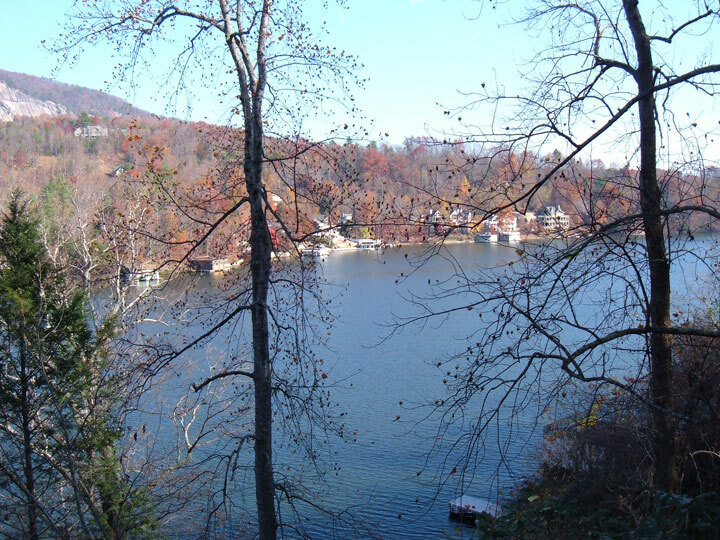 Here is a street view google map looking at the lake from downtown Lake Lure. 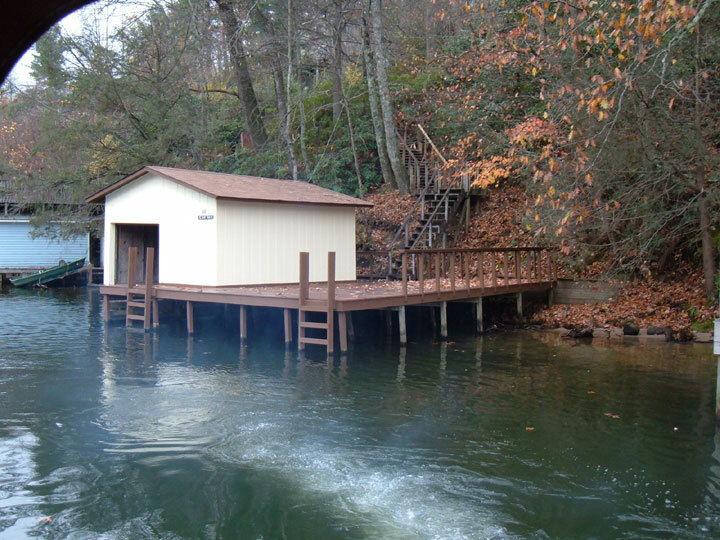 Our boathouse is on the main channel just around the corner. Just a few hundred yards from downtown.